Thaye Dorje, His Holiness the 17th Gyalwa Karmapa, invites students around the world to join him under the Bodhi Tree in Bodh Gaya, as he presides over prayers at the annual Kagyu Monlam, 16-22 December 2018. 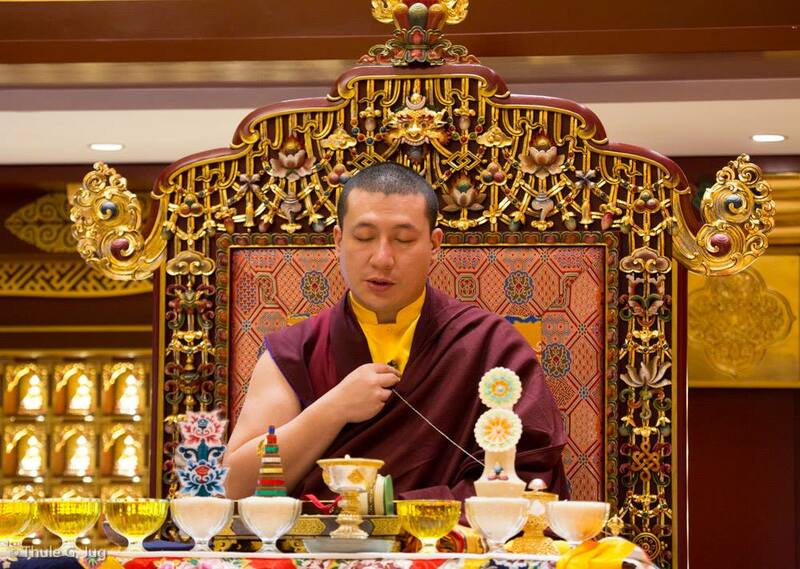 The Kagyu Monlam is the most significant event of the year for the Karma Kagyu lineage. Tens of thousands of students, monks, nuns and other venerables come together in the place where Buddha attained enlightenment, as Karmapa leads prayers for the benefit of all sentient beings. The main prayer recited at the Kagyu Monlam is known as the ‘King of Aspiration Prayers’ or the ‘Samantabhadra Wishing Prayer’. When we come together to the sacred place where Gautama Buddha reached enlightenment, and offer aspirations for peace and prosperity for all beings, the merit, wisdom and benefit that is accumulated is tremendous. 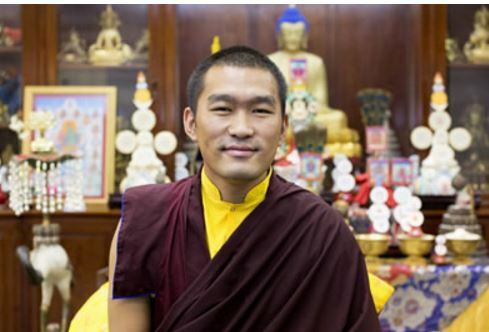 Practitioners around the world are invited to join Karmapa, in person or online. 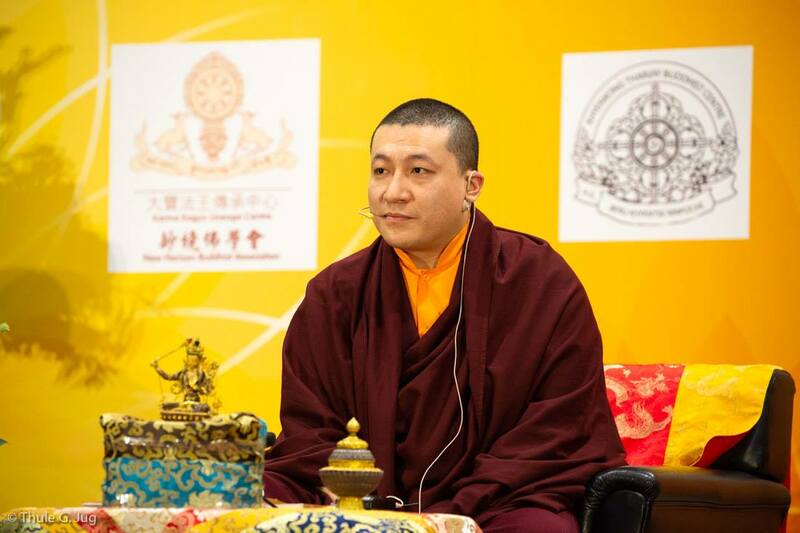 Several of the teachings will be live streamed so that students who are not able to travel to Bodh Gaya can still join Karmapa and their fellow Karma Kagyu students. Details for the streaming will be published in the coming weeks. 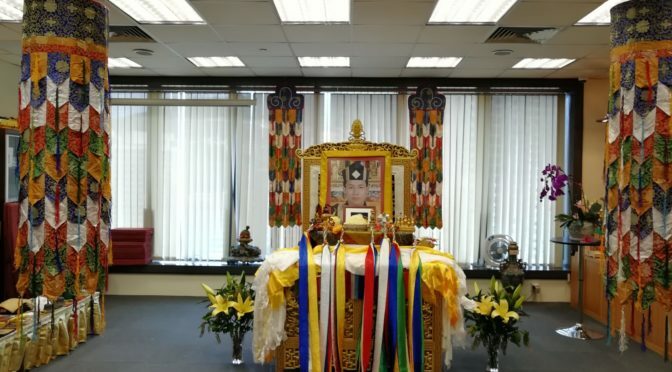 In addition to presiding over prayers at the Mahabodhi Stupa in Bodh Gaya, Karmapa will also be leading the Fourth International Karma Kagyu Meeting, and engaging in local community and charitable activities through his South Asian Buddhist Association (SABA). Thaye Dorje, His Holiness the 17th Gyalwa Karmapa, shares this message in the wake of the recent tsunami and earthquake in Indonesia. I am writing to offer my prayers for the people of Indonesia, following the tsunami and earthquake that has devastated the city of Palu, killing at least 380 people, and directly affecting thousands more. This tragic event and loss of life is yet another reminder of the impermanent nature of our material world. We may take some solace from this impermanence. For in the midst of great suffering and heartache, we may feel that there is no hope, and that we will always feel this pain. However, just as night never lasts forever, and the sun always rises again, so our pain is not permanent. We will feel hope again. Please join me in offering our compassion to all those affected by this disaster. 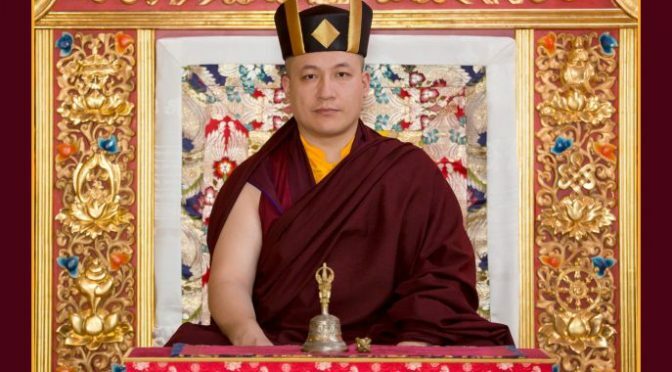 Thaye Dorje, His Holiness the 17th Gyalwa Karmapa, shares the following message after the recent flooding in the southern Indian state of Kerala. The devastation and loss of life in Kerala, caused by the worst flooding in a century, is difficult to comprehend. More than 300 people havez died. More than 200,000 people have been left homeless and in camps. With more rains predicted, the situation is feared to become even more dire. And yet, there is hope. This week, India celebrated its Independence Day – with unity in diversity, the whole country came together to celebrate, among other things, the resilience and strength of its citizens. These qualities, together with India’s spiritual wealth, are greatly needed at this time. While material resources and humanitarian aid are crucial – our prayers, our compassion, our loving kindness, are just as beneficial. 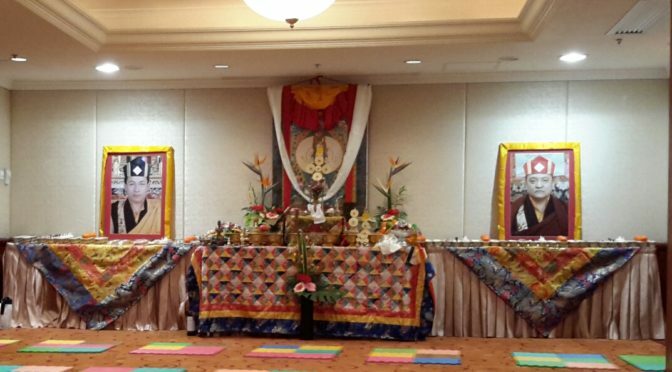 When we practice the Buddha dharma, and dedicate the merit of our practice to all sentient beings, we offer hope for those who need it most. May we all pray together for all those affected by this disaster. Thaye Dorje, His Holiness the 17th Gyalwa Karmapa, shares the following message after the recent bridge collapse in Italy. I am writing to you following the motorway bridge collapse in Genoa, Italy, in which at least 35 people lost their lives, including three children. It is natural, in the midst of such tragedies, to feel a sense of hopelessness. We may feel overwhelmed, to the point where we can’t even imagine any kind of hope exists. When hope is lost, everything is lost. As practitioners, we have an important role to show that hope still exists, even in the aftermath of such devastating news. As Shantideva says in The Way of the Bodhisattvas, ‘May the discouraged become uplifted and perfectly steadfast’. Through turning to our practice, again and again, we can be positive role models and inspire others on their path. Through the Buddha dharma, we can shine a light on hope even in the darkest of moments. May we all join in prayers for those affected by this disaster, and may all those who feel lost and suffering find hope. The devastating wildfires near Athens in Greece have claimed the lives of at least 76 people. The scenes of people fleeing for safety from the flames, mourning the loss of their loved ones, may understandably give rise to emotion. And so it is with the dam collapse in south-east Laos, which led to flash floods that killed at least 20 people, with more than 100 still missing. The aerial images of homes submerged by water, with villagers and children stranded on rooftops, may be upsetting for some of us. The practice of the Buddha dharma is a path to mastering our emotions, rather than letting our emotions control us. This is not about being heartless or uncompassionate – quite the opposite. It is at times like these, when natural or unnatural disasters strike, or when we experience tragedy in our personal lives, when the benefits of our practice – a practice of compassion – are most keenly experienced. The purpose of our practice is to give rise to Bodhicitta, the human heart. Through the practice of the Buddha dharma, we are able to experience limitless compassion and wisdom. We are no longer overwhelmed by anger, fear, or other afflictive emotions (klesa), and are instead able to tap into our Inner Wealth, our innate values, for the benefit of all. We experience all compounded phenomena as impermanent. In time, we are able to let go of fear and anger altogether, and let compassion rise. As I have said before, the compassionate heart is even more precious than a Buddha. In the human heart, we see limitless hope. Therefore, let us practice and pray for those affected by these and all disasters, and may the benefits of our compassionate hearts reach all sentient beings. All of us may not be related to each other by blood. Nevertheless, because we have a similar cause, because we all have similar aspirations and wishes, we are bound by that. We are bound by what we practice, we are bound by what we aspire to. So therefore, we are all another family for each other. The source of simplicity comes from the heart. Whenever we are in turmoil, confusion, all kinds of difficult thoughts and circumstances arise. When we calm ourselves down, whether we are Buddhist or not, in the end we can find a middle ground where we can say that applying the simple things in our lives makes sense. In Buddhism, everything is really about making things simple, so that we can apply them in our everyday life. The purpose of Bodhicitta is to generate a very kind and understanding intention or motivation for the benefit of all sentient beings.